Your story and your voice hold the key to your well-being, your power and your purpose. But most of us don’t have the tools to access our full story or to write with our full voice. Most writing programs focus only on the limited left brain and on the words on the page. Align Your Story’s unique method brings together meditation and optional yoga with powerful lessons and detailed close readings to bring together craft and process. It guides you to go deeper, quiet the mind, listen to the body and be inspired by other writers and thinkers so you can write your best work. It’s a space to reclaim your full story, to come out of secrets, to embrace your full experiences and the full emotional and embodied dimensions of your creative vision and voice. It invites you to join a wonderful community of supportive and inspiring women writers around the world. And once you join, you have lifelong access so that you can go through the course again and again at your own pace and continue to deepen your writing and your relationships in the community. Align Your story is designed for women who are complete novice writers and also for professional writers and everyone in between. This course meets you where you are, wherever that is, so that you can deepen your relationship with yourself and your writing life. And it gives you new tools that most writing schools don’t give us. It asks us to reconsider many of our implicit assumptions about writing that don’t help us, but actually hold us back and keep us stuck, unable to listen deeply to our voice or story. This course gives you the tools you need to get through the blocks and frustrations that have been holding you back. It empowers you to step into your fullness and to embrace your full story, whatever genre you’re working in, whether it’s poetry, memoir, fiction, creative nonfiction, or any other form of writing. It reminds you what it’s like to shine. Do you feel that you have something important to say but you can’t quite access it? Do you wish that writing were not as difficult? Do you sometimes wonder, “who do I think I am?” when you sit down to write? Do you feel out of joint in your mind and your body? Do you worry that if you write your story you will be trapped by its negativity? Do you want to jump into your positive memories and experiences, but you aren’t sure how? Do you worry what people will think of you if you tell your truth and what the consequences will be? Do you feel isolated and alone as a writer and want a supportive community? Are you ready to start giving your voice its real power and freedom? Are ready to write your best, most original work with your full powers? Enrollment opens only once a year. Join us! We start April 26th! Is there something in your own story that is holding you back? For the past 15 years, I’ve worked with both novice and professional writers who know they have something important within them, but also sometimes find the process frustratingly difficult and are ready to unleash their full creative power. We don’t allow ourselves to take ourselves seriously. And often each of us imagines it’s only us. We think there is something wrong with us. We become slightly ashamed. We think writing must be easier for other people. Or we buy into the myth that writers and artists are supposed to struggle. We buy into the idea of the “war of art,” that creativity is a struggle, a battle. We think this is just how it is. This is a problem for all writers. But it’s especially a problem for women, who have been taught for years to contort our natural experience to fit into other people’s ideas of ourselves. I get it. It’s not surprising that we have these antagonistic experiences with our creativity and our creative voice. After all, we’ve been taught to speak in other people’s voices. Whether it is the parent’s voice, the teacher’s, or the boss’s, usually there are external voices that have been internalized. Those voices might tell us that we’re not good enough. Or they might tell us that we’re “perfect.” But they don’t really see or hear us . Many of us have rarely been really given the space and freedom and tools to explore the full range of our story and our own voice; to put our mind and bodies together and listen deeply; to make mistakes; to try new things; to play and discover; to get quiet; and also to lovingly push ourselves to expand beyond our comfort range. Often, the fancier our education is, the less of this space we’ve been given. When we are given this space, we come to see that creativity does not need to be so difficult. And we come to know that the places of resistance, if we listen more closely, are really places of growth. In fact, with the right tools, your creative process can become a source of great pleasure and exciting insights and you will have the tools you need to write the work you’ve been wanting to write. Align Your Story gives you a whole range of tools, from practical tools of craft to embodied practices and writing prompts to help you come to love your writing. When you align our story, you can come to love your own unique woman’s story. And to share your full story and creative voice with others. I do this work because I also have this experience. Align Your Story brings together the rigor of an Ivy League education with the insights and wisdom of the meditative and yoga traditions and the heart and soul of a mother and activist. It gives you the tools to understand and expand your craft with the left brain and also the tools to, when appropriate, quiet that left brain and let other parts of yourself express themselves. The meditation quiets the constant chatter and stills the anxiety so that we can listen more deeply to our deeper insights. The yoga allows us to unlock the messages of our body. The course allows us to access a fuller range of knowing, emotional well-being, and expression. It connects in the same practice mind, body and spirit. It also gives you life-long access to a wonderful community of supportive and inspiring like-minded women writers around the world on the private facebook group and in the live conference calls. Align Your Story is designed for interested beginners and experienced meditation and yoga practitioners . Be guided by the course to create all new work. Or bring a writing project you’re already working on to the course and get new inspiration and tools for it. Whether you have a lot of time to devote to the class or just a little, the course can fit your schedule. You have lifetime access and can go at your own pace. And you can choose which aspects of the course to focus on. Unlike other writing groups, the focus of this course is not on constantly getting critique or on being expected to read and critique your peers’ writing. Instead the focus on this course is to learn to listen to yourself, practice new techniques and skills, access different parts of yourself in the writing process, go deep and become your own best witness, reader and editor. While there is opportunity to share your work, and many students do, that is optional, so that you have the ability to be as honest and exploratory on the page as you want. The next of round of Align Your Story starts April 26th and unfolds over 8 weeks,but you can go through at your own pace, if you prefer, and once you enroll, you have access to the material, the private facebook community, and the conference calls for life. Module 5 : JOY : Learn how to make your writing (and your life) come alive by accessing joy in the body and putting it on the page so that your writing has a greater range of emotion and experience. Module 7 : THE ART OF THE STORY LINE : Learn how to put the different pieces of your story or any story all together! Explore different techniques and possibilities and have the tools to decide which is right for which piece. Module 8 : WRITING FOR LIFE : Learn how to keep going for the long term and write what you love and love the writing process itself. Each lesson— on themes such as resistance, joy, childhood, revision and more—will explain and develop the theme of the module, bring together the different elements of the course, and help you connect to your voice and to the full range of your story and creativity. Course material is delivered in downloadable audio so that you can listen at your convenience and also as text. Each module offers carefully chosen close readings that illustrate the module’s theme and offer inspiring and beautiful examples since good writing comes in part from good reading. We read writers such as Sapho, Rilke, Proust, Rumi, Maya Angelou, Virginia Woolf, Zora Neale Hurston, Mary Oliver, Rebecca Solnit as well as inspiring thinkers such as Thich Nhat Hanh, Christianne Northrup and many others. A bonus section of extra suggested readings is also included in each module so you can go deeper if you want. Course material is delivered in downloadable audio so that you can listen at your convenience and also as text. Each module contains numerous in depth writing exercises and prompts that guide to through the course not only the first time but also so each time you come through the course. These prompts are designed for writers working in any genre and can be adapted for writers working on a larger writing project. In each module, I guide you through a carefully chosen meditation to help clear the static from your mind so that you can come into greater concentration, clarity and insight. I give you the tools to establish a home practice. Material is delivered with a short teaching video and audio to practice with. Each module contains numerous in depth writing exercises and prompts that guide to through the course not only the first time but also so each time you come through the course. These prompts are designed for writers working in any genre and can be adapted for writers working on a larger writing project. In each module, I lead a carefully selected yoga set to complement the theme of the week, deepen the focus of the lesson and bring mind and body into integration. Our bodies as well as our minds carry our stories, and the yoga is designed to help you listen to, release what you no longer need, heal and harness the power of your body’s stories and languages. The yoga can be rigorous for those looking for good physical, emotional and mental strength building and stamina, but it can also be modified for all body types and be taken very gently. Yoga is optional. Material is delivered with a teaching video and audio to practice with. Weekly conference calls/video sessions to ask questions, engage in discussion and practice together are offered once per module. This is a great way to connect more with the community of women writers around the world. These are optional and if you can’t make them live, you can email questions in advance. Everyone will get a recording. Once you enroll, each time I offer the course, you are invited to these live sessions. There is an ongoing facebook group of engaged, supportive, inspiring women writers around the world. We have students in Israel, England, South Korea, China, Canada, California, Texas, Ohio, Florida, New York, Massachusetts, Maine and many other places. Share work, ask questions, get support, offer feedback, be inspired. The facebook group is a great way to connect and also to make lasting friendships. Many students have made lasting in-person friendships from this group as well. 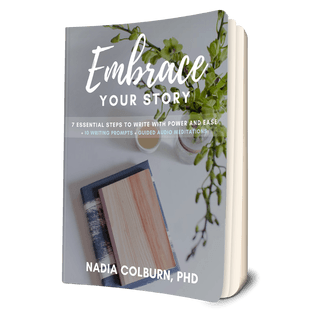 Hi, I’m Nadia Colburn, and I’m the founder and creator of Align Your Story. I believe that your voice and your story matter. I’m passionate about helping women share their unique stories and their creativity with the world. I was always a good student. I got straight A’s, went to Harvard and then to Columbia where I got a PhD in English. I was rewarded for my good writing. But the truth is, I didn’t really know my own voice or my own story. And while I looked “good” on paper, I wasn’t really expressing myself fully. My goodness was its own kind of trap. I needed not just to express my story, but also to understand and heal the places that were wounded. I needed to learn how to be my own best witness. To do this, I stepped away from a successful academic life to do the hard inner work of healing and growing and of showing up for myself—and also for my children. I didn’t want to just have things to teach from my mind. I wanted to learn how to live as myself with all my complexities in our complicated world. I needed to learn how to put the different sides of me together, the mind and the body and the heart and the spirit; they all felt fragmented. There wasn’t a model for me to do this: my creative writing community focused only on what was on the page; my healing and yoga and spiritual communities focused on the inner work, but didn’t have a way to integrate that work with outer expression or with coming back into the public world. I needed to create my own method. It was a long and bumpy path. In addition to my training as a an award winning creative writer and PhD in English who has been a literature professor at lead schools like MIT, and a creative writing workshop leader, I also got trained as a yoga teacher and became a serious student of Thich Nhat Hanh and have experience in ten day silent vipassana retreats and am trained as a kundalini yoga teacher. When I integrated these different modalities for myself, amazing things began to happen. I found that I could write from my center, with more ease and more power. Because I knew better who I was, I could access my own authority and write about my authentic experiences as a woman. I came to come to love my own difficult, twisty, painful, wonderful, joyful, unique story. I came to write about what it means to me to be a woman with a body, a woman who was once a girl and is now a mother, a citizen, a survivor, a lover, a thinker, an animal. In the process, not only did I feel less anxious, but also, many of the health problems that I had had for years also cleared up! I began to bring these methods to my students. I’ve now taught thousands of students and have seen the exciting transformations that this process brings to them. My writing has been published in more than 80 publications, including The New Yorker, Spirituality & Health, American Poetry Review, LA Review of Books, Tiny Buddha, Lion’s Roar, Truthout and many other places. My debut poetry collection, The High Shelf, will be published in 2019 and my essay “The Language of Silence: Listening to the Body” is published in The Anatomy of Silence: 26 stories about all the sh*t that gets in the way of talking about sexual violence” I’m a founding editor at Anchor Magazine: where spirituality and social justice meet, and have taught workshops in a wide variety of places including Copper Beach Institute, The Muse and the Marketplace, The MA Poetry Festival, The Harvard Divinity School and many other places. Each writer has a different story, but the unique method that I created first for myself and now share with others helps can help you access your true creativity and authentic voice–and authority. Your voice matters; your experiences; your story, and your creative vision matter. I want to help you realize them fully. This is powerful, transformative work that regenerates us not only individually but also collectively. It is the change we need and the change the world needs. I offer this class only once a year. This year’s session of Align Your Story starts April 26th. Concerned you don’t have time to participate fully in the course? Don’t worry: once you enroll you have lifetime access so can go at your own pace and come back through the course as many times as you want. This audio meditation and writing prompt is designed especially for women to empower you to access your inner feminine power and bring it out. This bonus lesson is designed to help you think about this history of women’s voices in our culture and will guide you through placing yourself in the context of that shared history and also of your family and personal histories. Do you ever sit down and find that, whatever you do, you can’t get out of the way of your nasty inner critic, even after meditation? This check-list, available only as a bonus to Align Your Story, will give you some powerful tools to shift those voices. We’re more successful at asking the inner critic to get out of the way if we have a plan to do when she comes back during revision and editing time. This revision sheet will give you the tools you need to make sure you’re doing your most successful editing. Sign up with a friend and each of you get a 100.00 USD discount! ** The premium plan is open only to the first ten students who sign up. Got questions about Align Your Story? I go over the most common questions below. You will learn to become your own best witness in the safety of a supportive group. The course also includes a one-on-one coaching session with me that you can use to get feedback on a limited amount of written work. And if you want more feedback you can schedule more coaching with me. You can take this course to help you with a pre-existing project that you are already working on. If that is you, just reach out to me in the first week of the course, and I can guide you through that process. That said, even when we are writing about a completely made up bank robbery, some part of us is writing from our childhood self. So take the time to really dive in and explore writing from your childhood. Again, you might surprise yourself by what you write–you might find yourself writing about things you didn’t remember you remembered or writing in a tone that surprises you utterly. You get to have live check-ins with me and a community of supportive writers, with whom you can have a life-long connection. And for a limited time, participants also receive a free fifty-minute one-on-one session with me. Fourth, while the Artists Way focuses mainly on writing exercises, my course also develops deep reading skills. I believe that good writing comes from good reading. And I also believe that good reading awakens and fuels our creative selves. Included with each module is suggested reading of great published texts and close readings of those texts, that help you understand both content and technique. Your Story and Your Voice Matter! When you sign up you can feel fully confident that if you’re not happy with the course, I offer a full money back guarantee for 30 days after the course begins. When you sign up for a course like this, you’re making an investment in yourself. I’m here to support you. If you do the work for the first three modules of the course (and can show me that you’ve done some of the work) and if you aren’t satisfied for any reason, I’ll refund your money (for classic plan members I’ll refund 100%; premium members get the remainder of the price back minus the one on one sessions they’ve already had with me). I don’t offer money back guarantee if you sign up but don’t have time to do the course work. Once you enroll, you have lifetime access, so if you can’t start right away, you can come engage with the material and community later. When you sign up you are making a commitment to yourself that you’ll invest at least some time and energy into your own life as a writer, and I want to help you make that commitment to yourself. Just try the material.